"Secretary General of the President's office, Al-Tayeb Abd Al-Rahim, delivered a speech in which he praised the qualities of the deceased. He stressed that the loss of [rank] Al-Hindi is a great loss to the Palestinian people, who are bereaced of a prominent national leader. 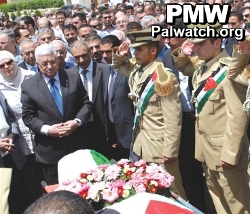 Abd Al-Rahim noted that the deceased had been taught by the founders of the Palestinian dream, and was a member of the founding generation of the [Palestinian] revolutionary movement... The Secretary General of the Presidential office said: 'We shall continue in the path of the Shahid (Martyr) Yasser Arafat and his fellow Shahids, such as [rank] Amin Al-Hindi, until the realization of the dream of establishing an independent Palestinian state with Jerusalem as its capital.'"